Today this showed up on my dash. It’s not the first time (and it will in all likelihood will not be the last time) that this kind of attitude has popped up, and I wish I could kill it with fire. As my buddy Heather likes to point out, there is no wrong way to be a girl. I wish people would stop putting down other women and invalidating their choices because they don’t match their own. It doesn’t matter if a girl prefers facebook to tumblr, makeup to a bareface or shopping to videogames, because she is a complex human being, who doesn’t deserve to be written off because she doesn’t match your idea of what’s special or different. Please stop simplifying women to caricatures. And last time I checked, one can enjoy shopping and videogames. Preach it! 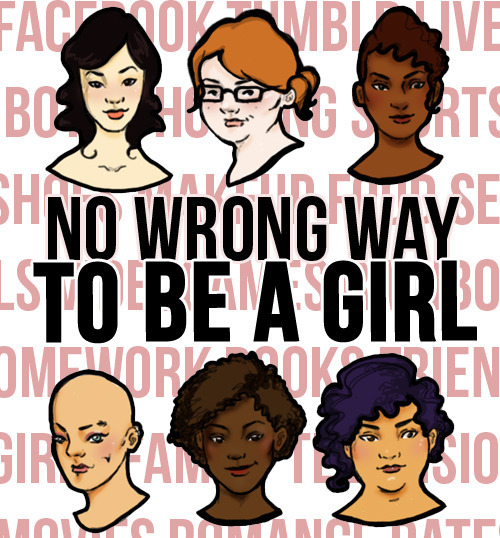 Tell your friends, sisters, cousins, nieces, daughters, and little kids on the street: There Is No Wrong Way To Be A Girl.